The Breitling Navitimer is one of the world's most famous pilot's watches. Its slide rule bezel is its most striking feature. Top models are made of 18-karat gold and are powered by an in-house caliber with a split-seconds chronograph. The Breitling Navitimer remains the company's most successful model to date. First introduced in 1952, it is still considered an icon among pilot's watches. The memorable name of this chronograph is a combination of the words "navigation" and "timer" and reveals its purpose: Thanks to its slide rule bezel, this watch can make the same mathematical calculations as an onboard computer. Its functionality goes far beyond that of a typical chronograph. Pilots can use this watch to calculate speed, fuel consumption, climb and descent rates, and to convert between units, among other things. Breitling has been outfitting the Navitimer with their independently developed in-house B01 caliber since 2009. The design of the dial and layout of the subdials strongly resemble those of the original model. Current top models feature a rattrapante (split-seconds) chronograph function that was also created by Breitling. The limited edition models are of particular interest to collectors. This includes the Breitling Navitimer 01 Blue Sky Limited Edition with a blue dial. It was created in 2012 in celebration of the Navitimer's 60th anniversary and had a limited run of 500 pieces. There are also only 500 examples of the Navitimer AOPA from 2015. The abbreviation AOPA stands for the Aircraft Owners and Pilots Association. Founded in 1939, this organization is the world's largest association of pilots and aircraft owners. In early 2018, Breitling announced a redesigned Navitimer collection, the Navitimer 8. The new design foregoes the characteristic slide rule bezel, giving this line a tidier and more elegant feel. It is available in chronograph, world timer, and three-hand variations with a date or day-date display. The number '8' in the series' name comes from the Huit Aviation department founded in 1938. Its onboard clocks had an eight-day power reserve. The French word 'huit' means 'eight' in English. 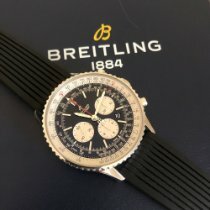 How much does a Breitling Navitimer cost? The current 43-mm Breitling Navitimer B01 in stainless steel with an in-house caliber costs about 6,300 USD in mint condition and 5,800 USD pre-owned. The price for a new 18-karat rose gold edition comes in at just over 15,100 USD, while a pre-owned piece goes for around 12,300 USD. Plan to spend 6,600 USD on a mint-condition 46-mm model in stainless steel and 5,700 USD on a pre-owned example. The so-called "Old Navitimer" is outfitted with the automatic Valjoux chronograph caliber 7750 and is much more affordable: You can purchase a pre-owned watch for just under 4,000 USD. Breitling still uses this movement in their Navitimer collection. Never-worn stainless steel pieces cost as little as 4,200 USD. You can get the 45-mm Breitling Navitimer B03 Rattrapante from 2017 in stainless steel with an in-house split-seconds chronograph movement for around 9,500 USD. The rose gold version had a limited run of 250 pieces and costs over 33,400 USD. Another limited edition, the Blue Sky, had a 500-piece run and is extremely difficult to find. 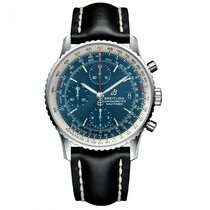 The Navitimer AOPA from 2015 is just as rare. This luxury watch features the AOPA logo on both the dial and case back, a feature commonly found on early models from the 1950s. With an official list price of 8,900 USD, the AOPA Navitimer is slightly less expensive than the Blue Sky. The Navitimer 1884 is yet another limited edition model. 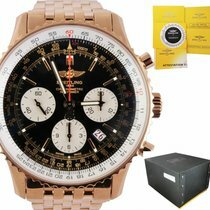 Its name refers to the year Breitling was founded. This model saw the addition of a central pointer date and a day and month display. Breitling fans refer to this combination as "Datora." Be prepared to spend around 7,400 USD for this timepiece. If you'd prefer to only have to change your calendar once every four years, you should take a closer look at the Navitimer 1461. It accurately displays the date, day, month, and moon phase for 1,461 days or 4 years. At 46 mm, this is one of the larger Navitimer models. You can buy a pre-owned example for a relatively affordable price of 5,900 USD. Pieces in mint-condition demand around 8,500 USD. Fans of vintage watches will find early Navitimer models particularly exciting. These can be found under the reference number 806 and are mostly outfitted with the manually-wound Venus 178 caliber. Some individual pieces may be powered by the Valjoux 72, which is also wound by hand. Variants with this caliber are especially rare and therefore highly coveted. Depending on its condition, prices for a Navitimer ref. 806 range from 3,700 to 12,400 USD. Gold-plated models are less sought after, but similarly priced. Editions in 18-karat gold are even harder to find and much more expensive. Breitling's automatic chronographs powered by the caliber 11 are just as interesting. Next to the Zenith El Primero, this movement was one of the first automatic chronograph calibers. In the 1960s, Breitling, Heuer-Leonidas, Dubois Dépraz, and Büren collaborated to develop the caliber 11. You can recognize this movement by its left-sided crown. The large case of the Breitling Navitimer Chrono-Matic is yet another characteristic feature. With any luck, you might find a model from the 70s for as little as 2,500 USD. However, limited editions and those made of gold can cost more than 12,400 USD. 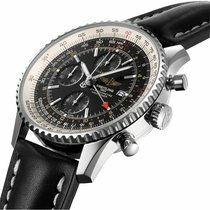 How much does the Breitling Navitimer 8 cost? Introduced in 2018, the design of the Navitimer 8 deviates greatly from that of the classic Navitimer. Even though this new collection is missing a slide rule function, every model can measure periods of time. This is done using the bi-directional bezel with triangular markers. The collection's entry-level model is a three-hand watch with a date display and goes for around 3,200 USD. At 3,500 USD, the Day-Date version is only slightly more expensive. If you need a chronograph function in addition to the day-date display, the Navitimer 8 Chronograph 43 with the Valjoux 7750 movement may be the watch for you. Prices for this sports watch start at 4,500 USD. For about 1,800 USD more, you can get the version with the in-house B01 caliber with chronograph functions and a date display. The Navitimer 8 B25 Automatic Unitime 43 has a world time function and costs 6,600 USD. If you are looking to call the desirable rose gold edition with a brown dial on a brown crocodile leather strap your own, be prepared to spend around 17,300 USD. The origins of the Breitling Navitimer date back to 1942, with the introduction of the Chronomat. This wristwatch had a slide rule bezel that allowed for various calculations. Its name is a combination of the words "chronograph" and "mathematics." This pilot's watch was even used by the American Air Force. In the 1980s, the slide rule was replaced by a bezel with four rider tabs at 3, 6, 9, and 12 o'clock. This bezel design has characterized the Chronomat ever since. Breitling introduced the Navitimer in 1952. Their target group was obvious: Its dial featured the logo of the world's largest group of pilots and plane owners, AOPA. The circular slide rule enabled calculations essential to flying. Breitling most often used the Venus 178 to power the watch, though they also temporarily used the Valjoux 72. Since its inception, Breitling hasn't wavered from the Navitimer's fundamental concept. The wrap-around scales remain a distinguishing feature of newer models. Ten years after its premiere, the Navitimer caused a sensation when it became the first chronograph to enter space on the wrist of an astronaut. Scott Carpenter wore it in May 1962 on board the Aurora 7 spacecraft. A special feature was its 24-hour scale, which allowed Carpenter to determine whether it was day or night back on Earth. Unfortunately, this watch suffered water damage upon its return to the Earth's surface, so it was sent back to Breitling. At some point, this historic wristwatch was lost and remains so to this day. Breitling has released multiple limited editions of the Navitimer Cosmonaute over the last few decades. One such model was presented in 2012 to celebrate the 50th anniversary of its journey into space. Fittingly, it had a limited run of only 1,962 pieces. The manually-wound caliber 02 ticks away inside this watch. Like Carpenter's model, this remake also features a 24-hour scale. A scale to convert between Celsius and Fahrenheit is engraved in the case back as well as the logo of the Mercury-Atlas 7 mission. Prices for this timepiece sit around 7,400 USD. Léon Breitling founded Breitling in 1884, and during the First World War, the company was already supplying dashboard and pilot's watches. The company presented the first chronograph with a push-piece at two o'clock in 1915, and they introduced their first chronograph with two push-pieces in 1934. The new push-piece beneath the crown reset the timer to zero. This new method quickly spread to other manufacturers' products and is standard today. Above all, the watch's numerous numbers and lines on the dial give the Navitimer its distinct look. The outer scale is controlled by turning the bezel, while the inner scale doesn't move. Turning the outer scale against the inner turns the watch into a round slide rule, making it possible to make a number of calculations necessary for flying. Using the Navitimer, you can convert land and nautical miles into kilometers and vice versa. It's also possible to calculate miles or kilometers per hour and the rate of descent or climb. If you know your speed and the time, the Navitimer can determine how far you've traveled. You can also calculate your fuel consumption. Breitling has a user guide available with illustrative examples on their website. Breitling is proud of the fact that an in-house caliber powers the classic Navitimer. For its name, the company decided on Breitling 01. The in-house automatic caliber was introduced in 2009. It vibrates at 28,800 A/h, has 47 rubies, and boasts an impressive 70-hour power reserve. The B01 can measure time to a fourth of a second. The Cosmonaute with a 24-hour scale uses the B02, while the GMT edition uses the B04. Both are in-house movements with a vibration frequency of 28,000 A/h and a 70-hour power reserve. In the past, Breitling had often chosen ETA movements to power the Navitimer. There's no disadvantage to using them, seeing as they're reliable Swiss calibers every experienced watchmaker can maintain and repair. Occasionally, you'll find Navitimers with quartz movements and digital displays. These watches were Breitling's response to the watches coming out of Asia and they remain a novelty today. What alternatives to the Breitling Navitimer can you find in the luxury watch market? Luckily, there's no shortage of high-quality pilot's watches. Worthy of mention are the Fortis Flieger and the IWC Pilot's Watch Chronograph. One competitor comes particularly close to the Navitimer: the Sinn 903. This is no coincidence, either, as the German manufacturer purchased the license from Breitling to create a largely identical watch during the quartz crisis. The Sinn isn't the original, but has its own advantages. It's water resistant to 100 m (10 bar, 328 ft), while the Breitling Navitimer is only water resistant to 30 m (3 bar, 98 ft). You can buy a new Sinn 903 for around 3,100 USD. The manufacturer powers this watch with the SW 500 from Sellita. The SW 500 is a recreation of the famous Valjoux 7750 movement.